Newdelhi:5/11/18:Prime Minister Narendra Modi met with H. E. Mrs. Kim Jung-sook, First Lady of the Republic of Korea today. First Lady Kim is visiting India at the invitation of Prime Minister Modi. She will be the Chief Guest at the Deepotsav event being organized by the State Government of Uttar Pradesh and the ground-breaking ceremony of the new Memorial of Queen Suriratna (Heo Hwang-ok) in Ayodhya on 6 November 2018. Ayodhya and Korea have a deep historical connection through the legendary Princess Suriratna of Ayodhya, who traveled to Korea in 48 CE and married Korean King Suro. 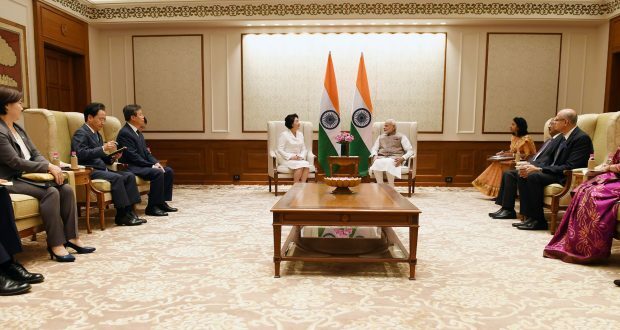 In their meeting today, the Prime Minister and First Lady Kim discussed the deep civilizational and spiritual links between India and Korea, and exchanged views on promoting people-to-people exchanges. First Lady Kim congratulated the Prime Minister on being awarded the Seoul Peace Prize. The Prime Minister said that this honour truly belongs to the people of India. The Prime Minister also warmly recalled the successful visit of President Moon Jae-in to India in July 2018, which imparted fresh momentum to India-Republic of Korea Special Strategic Partnership.